It was a tough night for the Southport Cardinals who had a poor shooting performance. 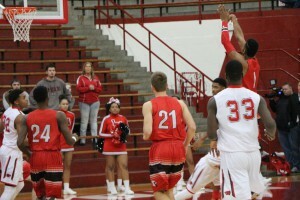 After blowing out #1 North Central in round two of the Marion County Tournament, Wednesday night, Lawrence North came into the Historic Southport Fieldhouse Friday night stealing one from the Cardinals 53-52. Southport trailed most of the night by double digits but came back in the fourth giving fans that feeling that they were gong to win another big one but it wasn’t to be. #1 Paul Scruggs was well-defended struggling from the field and ending up with just 5 points but big man Joey Brunk got hot in the second half finishing with a team high 15 points. There was a good size crowd in the fieldhouse due in part to Perry Meridian playing in the second game. Ironically Southports next game is at home January 20th against Lawrence North. For many more pictures log onto the Perry Township Schools Facebook page.